Wheel suspension Independent wheel suspension with lower diagonal suspension links and upper wishbones, coil springs and interna! dampers. ¡.Remove propshaft with drive shaft. 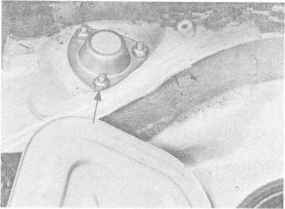 3.Take off brake disk after removing two countersunk screws. 4.Remove parking brake shoes and expansion lever. Pull parking brake cable out of its guide in wheel carrier. 6.Unscrew eccentric bolts and stabilizer linkage bolt and remove lower diagonal suspension 1 ink. Notes on Wheel Suspension, 86 Models Onward. The exhaust system has been modified as of model year 86. 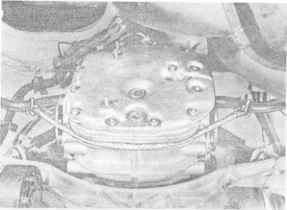 Two secondary mufflers are mounted near the control arms, one on each side. 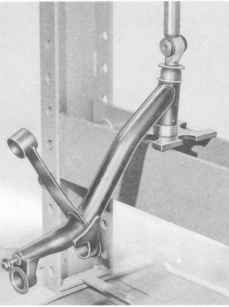 - Bearing link of lower suspension link mounted on a removable light-alloy casting (instead of directly on body). 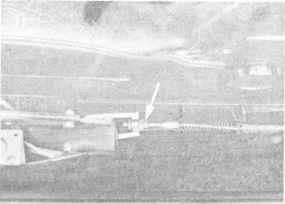 - The length of the track eccentric bolt (2) has been changed to suit the modified bearing (bolt shank approx. 10 mm longer). 2.Coat shanks of camber and track eccentric bolts with Optimoly TA (instead of multi-purpose grease with MoS^) and coat thread with Optimoly HT. Apply a coating of Molykote U to rubber bushing of stabilizer linkage and rubber bushings No. 39 and 40 of lower control arms (page 42-2) before installing suspensions links in car. See Table of Consumables (Technical Information Group X) for further lubrication notes and specifications. Spray toe-in eccentrics and camber eccentrics on both sides, adjustment for spring plate on damper and ends of bearing bolt threads (wheel carriers) with underbody wax such as Tectyl - UL - 846 manufactured by Valvoline. This precaution prevents corrosion of the threaded connections, thus facilitating future maintenance and repair work. 3.Tighten bolts and nuts to specified torque. 1.Inspect parts for damage, compare suspect parts with new parts. Do not mix up left-hand and right-hand lower diagonal suspension links (otherwise spring travel is impaired). 1. 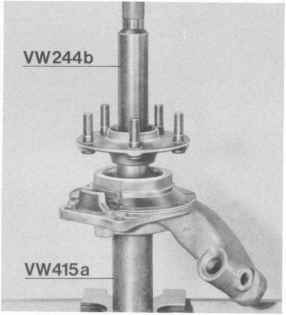 Press out wheel hub with VW 244 b and suitable base plates. 4. Press bearing inner race off of wheel hub with an extractor and Special Tool VW 407. 3. Press out ball bearing with VW 415 a after heating hub carrier to 120 - 150° C (248 -302° F). 1. 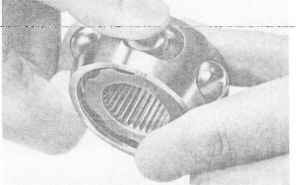 Heat hub carrier to 120 - 150° C (248 - 302° F), install ball bearing and then pres on slightly. 2. Press in wheel hub after installation of circlip and brake backing plate. 1. Remove boit "from link pin. 2. Place lower control arm on Special Tool VW 402. 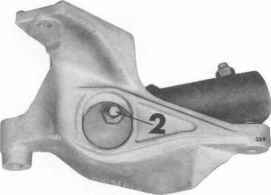 Press out link pin with Special Tool VW 407. 1. Coat holder and link pin with waxfree Capella Oil B (Texaco). Install link pin by hand so that bend of link pin faces in toward lower control arm and holes for mounting bolt are aligned. 2. Press in link pin far enough so that bolt can be installed without applying force. Rubber mounts used for lower control arms have a long service life, but if they do have to be replaced this can be accomplished with the following tools and application of waxfree Capella Oil B. First press out inner metal bushing. Make sure that inner bushing is not displaced. Press out mount with Special Tool VW 408 a, using Special Tool VW 415 a as a base. Press in mount, using waxfree Capelia Oil 8 (Texaco) and Special Tools VW 415 a and 408 a. Position correctly. Apply pressure pad to conical end of metal bushing to prevent any change in position between the metal bushing and rubber mount. 1. Unscrew three self-locking nuts from spring strut in luggage compartment. 4. Disconnect stabilizer bar link at control arm. 1. Replace self-locking nuts. Check spring strut seal, making a new permanently elastic seal on the mounting plate 300mm long and circular in shape with, for example, Prestik 4 mm dia., Item No. 0593 from Bostik. Coat rubber mount on mounting eye with Molykote U. 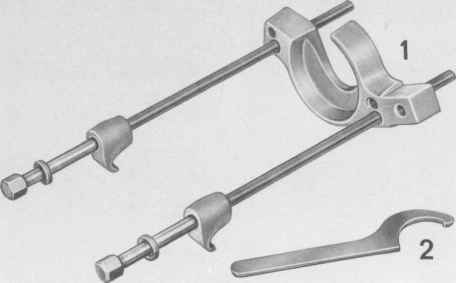 2, Tighten to specified torques. 3. 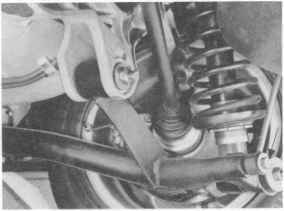 Note installed position of lower shock absorber. 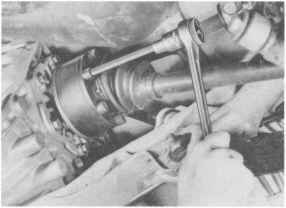 Turn lower shock absorber to correct position with a hook wrench applied to adjusting nut.Select direction of turning so that stop of spring retainer remains on end of spring. 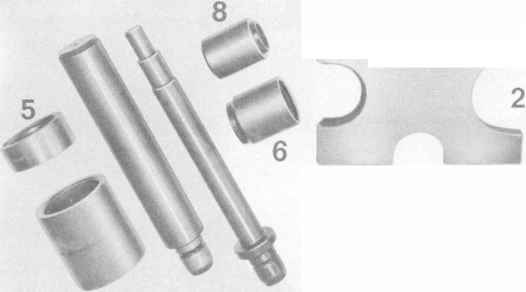 Further the adjusting nut must not be turned against the threaded sleeve, so that the car height adjustment is not changed. 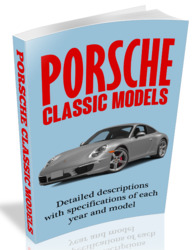 Porsche version by Klann, see Workshop Manual (Workshop Equipment 3, group 4) for description/ supplier. 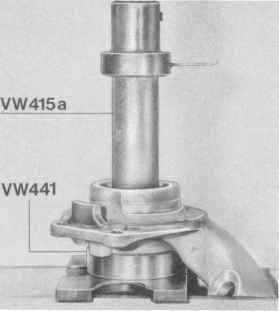 1.Using Porsche-version Klann spring tensioning device (see Workshop Manual) or VW 340, stretch coil spring. 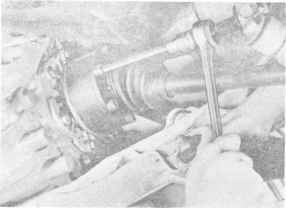 Remove self-locking nut from piston rod. Remove mounting plate with support plate. Dampers can only be tested properly on a test bench. Although inefficient dampers cannot be identified, a visual inspection or check of operation will identify completely defective dampers. 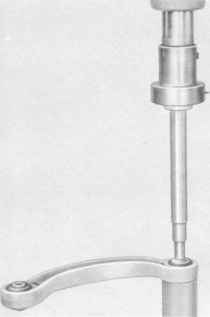 Distinguishing features of dampers, see page 42 - 18d. With damper in installation position, extend and compress by hand. 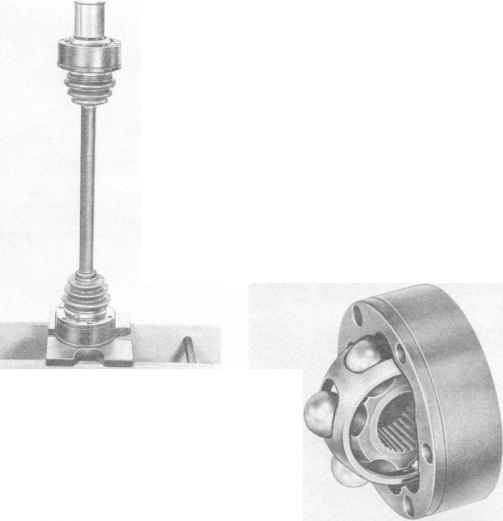 The damper must move smoothly and with uniform resistance through its entire travel. The extension and compression-stage damping must be-felt clearly-right up to the-final positions. Dampers which have been stored for an extended period of time should be pumped in and out several times in the installation position. Replace leaking dampers. 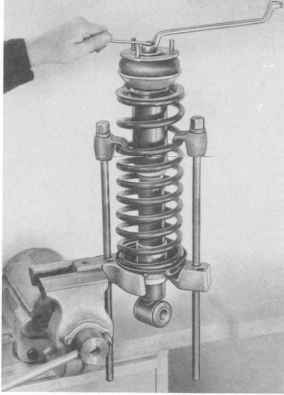 2.If special tool VW 340 is used, relax tension on coil spring by screwing down each of the clamping bolts in turn. 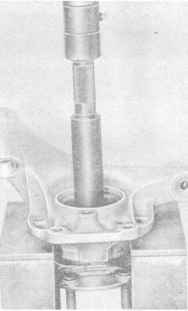 piston rod increases as the rod moves into the damper. 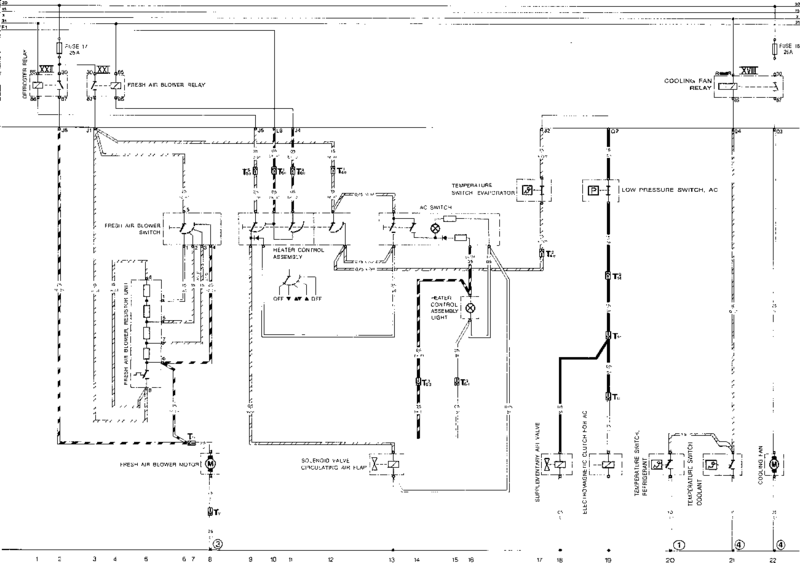 If dampers have been stored for a long time, pump in and out several times in installation position. If dampers have depressurized (damper does not return automatically to expansion-stage and stop), but show no signs of escaping oil (oil stain) and fulfill the remaining requirements, they can be reused. Dampers which show traces of oil leaks and have lost their gas pressure must be replaced. Worn Bilstein dampers can be readily identified. Measure dimension X with damper completely compressed (i.e. as far as possible). If dimension X is larger than 18 mm (new damper 8.5 mm), the damper must be replaced. 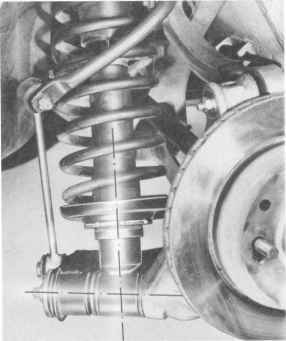 Rear-axle springs are available in three versions. The versions are color-coded. The springs with green, yellow and blue coding are further subdivided in tolerance groups. When replacing, always install springs with the same color coding. Under no circumstances may yellow, green and blue springs be combined. 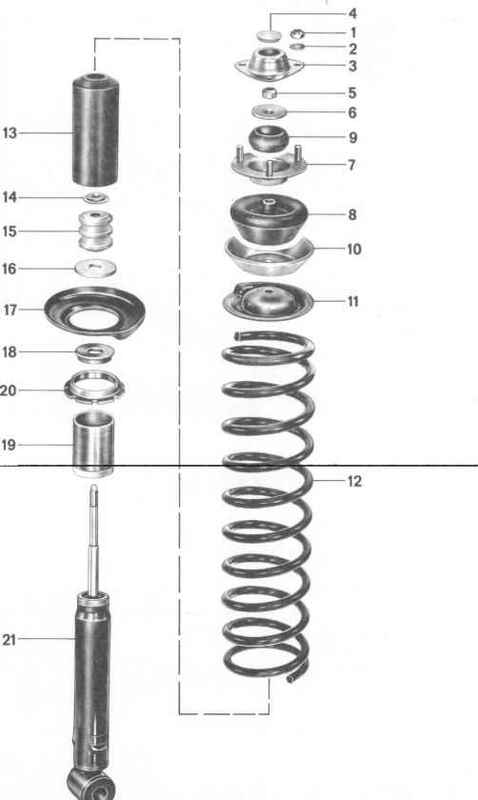 As car height is adjustable, it is not necessary to correlate spring groups with certain model types (e.g. with or without air conditioner, left-hand or right-hand drive). in the current 84 model year, the coil springs, both spring plates of the supporting plate and the adjuster nut with threaded sleeve have been modified to reduce weight. models as of the chassis numbers listed above, Part No. 928.333. When removed, the pressureless damper will remain in any desired position. When the gas pressure damper is removed it extends to the expansion stage stop. 1. Remove cylinder head bolts on transmission and wheel ends. 1. Remove socket head bolts on transmission end and self-locking nut on wheel end. Self-locking nut is accessible after removing wheel cover. Wheels do not have to be removed. 2. Run out axle shaft on right and left sides toward inside. Lower rear end of exhaust assembly on left side. 1. Run axle shaft into wheel hub on wheel end (lubricate splines and threads with Optimoly HT). 2. Install socket head bolts on transmission end (axle shaft flange surfaces must not have grease). 3. Tighten socket head bolts to 83 Nm and self-locking nut to 460 Nm. 2. Run out axle shaft on righthand side toward inside. 3. Run out axle shaft on lefthand side toward outside, after removal of rear wheel. 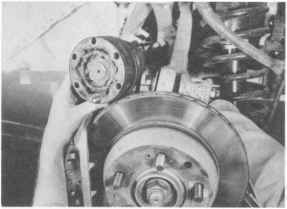 Make sure that grease from constant velocity joint does not come on brake disc. Clean axle shaft flange surfaces to remove grease. Tighten bolts to 83 Nm. Pack 80 grams of grease in each joint groove on outside diameter of joint to outside of propeller shaft. The welded axle shaft has a different dust cover with improved sealing. The dust cover has a bead (arrow) and the sealing flange a groove. 3. Remove circlip. 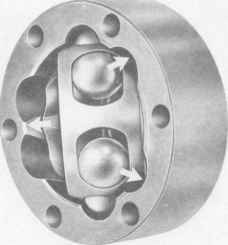 of sealing flange. 3. Replace gasket on flange cover. 5. Pack constant velocity joint from each side with approx. 40 grams of special grease uniformly. Total quantity of grease: 80 grams. Special grease is only for joint. Never use grease in dust cover. 80 grams of special grease is delivered with each spare dust boot and each spare constant velocity joint. 4. Press off constant velocity joint using special tools VW 401 and VW 408 a. 1. Swing out ball hub and ball cage from joint and press out in direction of arrow. 6, Position dust boot correctly. Install lamp. 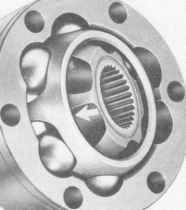 Joint must be disassembled to replace grease when seriously contaminated or when bearing surfaces and balls have to be inspected for wear or damage. Ball hub and joint are paired. Don" i mix them up. The 6 balls for each joint also belong to one tolerance group. 4. Install huh with cage and balls in joint pointing up. Wake sure that after swinging in hub into joint one wide ball groove "a" on joint is together on one side with a narrow groove "b" of hub. 2. Tilt ball hub out of ball cage via ball groove (arrows). 1. Check joint, ball hub, ball cage and balls for pitting and scoring. Excessive radial play in joint will be noticed by knocking noises when accelerating/decelerating. Replace joint in such a case. Slight wear spots and tracks of balls are no reason to replace joint. 3. Press balls into cage, shaft. 5. Swing in ball hub with cage. To accomplish this, swing out hub from cage so far that balls are at same distance as orbits (arrows). 7. Check function of joint. 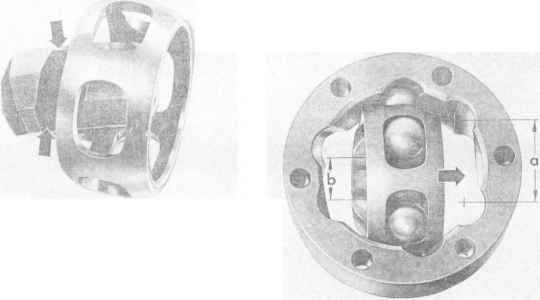 Constant velocity joint has been assembled correctly, if ball hub can be pushed back and forth by hand over the entire axial compensation distance. 6. 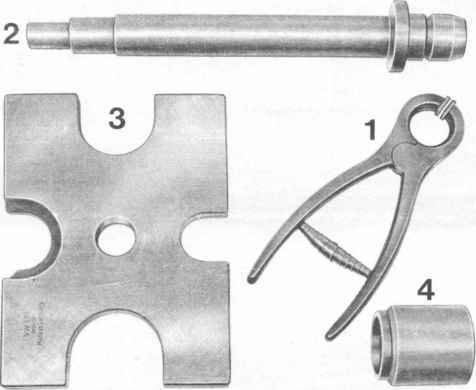 Press hub with balls into joint (arrow). 1. Unscrew M 10 self-locking nuts (3 per side) from spring struts in luggage compartment. Remove rear wheels. ?.. Disconnect parking brake cable :t connecter and puit bac!< on) f guitM . 3. Detach brake calipers and suspend from piece of wire. Be sure that brake noses are not too tight. 4. Remove exhaust system as far as necessary depending on version. 5. Disconnect axle shafts at transmission and suspend from wire in horizon)al position on rear axle cross member. 6. Disconnect stabilizer at lower control arm. 7. Support transmission from stabilizer bar with special tool US 8031. 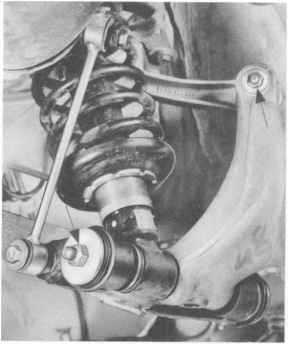 Rear Wheel Suspension, Axle S h a f ! *. Unscrew two mounting bolts of rear axle cross member as well as two bolts of transmission mounts. 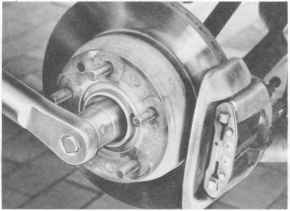 Since shims are installed between transmission mounts and the rear axle cross member, note quantity, thickness and location for installation later. 9« Mark position of floe) eccentric bolts. Remote bolts from rear axle cross member. 10. Place floor jack underneath rear axle cross member. Mark position of rear axle cross member. Remove remaining 4 bolts of rear axle cross member. 11, Lower rear axle carefully and be careful not to twist the spring struts, control arms or rear axle cross member. 1, Check spring strut seal (seal between mounting plate and body), tf necessary, make a ne^ permanently elastic seal, e.g. 4 mm dia. Presik, Hem No. 0593 from Bostik. 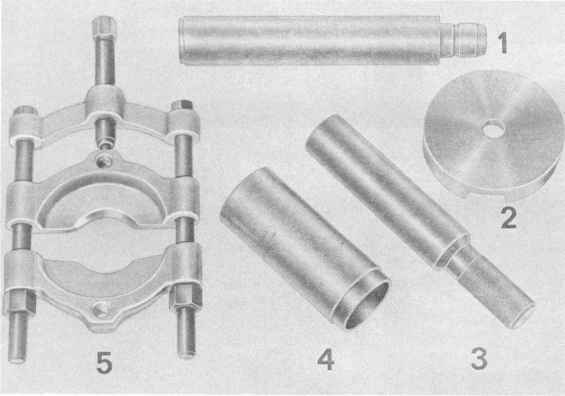 300 mm long, circle-shaped, on the mounting plate. 2. Move in rear axle. 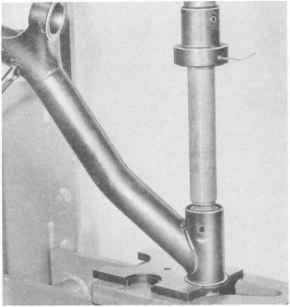 Install mounting bolts and align axle to original position as marked. Tighten bolts to specified torque. 3. 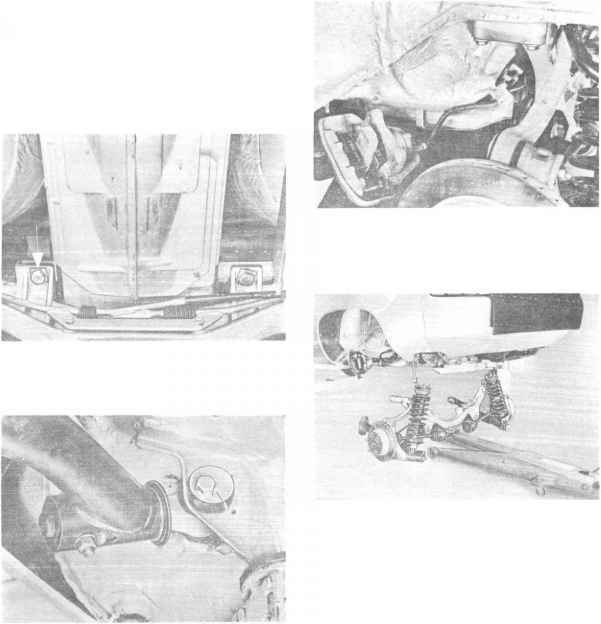 Align transmission suspension (see point 8,). 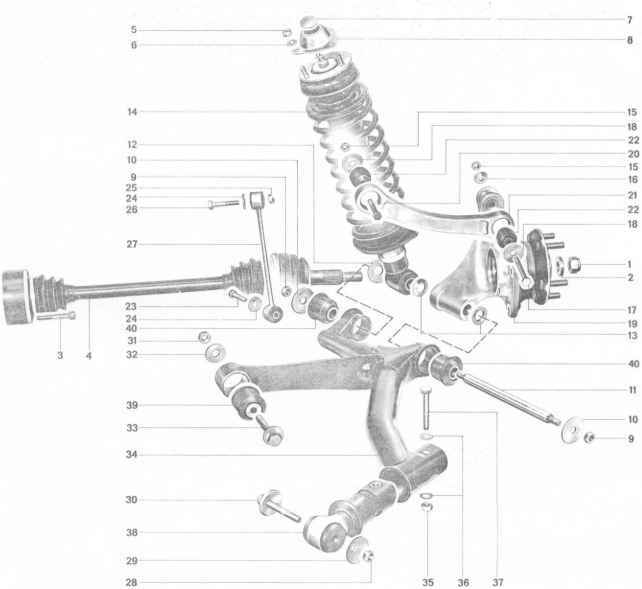 Refer to Group 34 if transmission suspension has to be completely aligned, using new parts.